At various times, I've mentioned my extensive collection of cookbooks. Hundreds and hundreds of them. But not until today have I seen a list of cookbooks where I do not own a single one. That's because The Huffington Post has compiled quite the list! 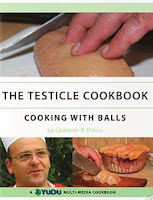 A list they call "The Most WTF Cookbooks of All Time." You have got to take a look at their slideshow of cookbook covers! From a serial killer's cookbook to trailer park down home cooking to cooking with iguanas and a book dedicated exclusively to testicles. And lots of other random, unusual cookbooks. Now my cookbook collection, as large as it is, feels a bit boring! Maybe I should start eating iguana. Where does one purchase a cooking iguana? And are they kosher? What a fun idea! You inspired me to look at my collection to find my most unique and interesting cookbooks. I found 2 that I particularly like...One is "Cooking with Catfish Hunter: Tasty Recipes for People with Diabetes" and the other is "Smokehouse Ham, Spoon Bread, & Scuppernong Wine: The Folklore and Art of Southern Appalachian Cooking." Possum and Sweet Potatoes or Deep-Fat Fried Rattlesnake might just be the featured entree of our next company meal! H.C. - Wow! What a great find. Thanks for sending that list. I cannot believe #1 on the list exists! !